Members of the [Co.R.E.] and T.O.R.Q. 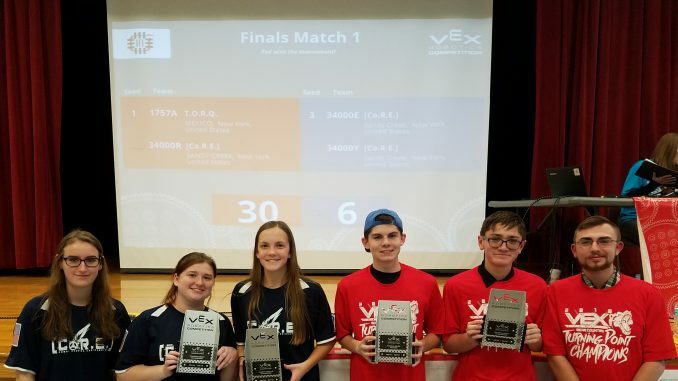 teams following their successful win at a recent robotics tournament held in Chittenango. Pictured left to right are: Margery Yousey, Sadie Lurcock, Hailey McNitt, Evan Blunt, Brian Thorp, and Stephen Ruffalo. On Saturday December 1, the [Co.R.E.] Robotics Teams competed at the Bear Country Turning Point tournament in Chittenango. After a long day of qualifying rounds versus 31 other teams, [Co.R.E. ]’s “R” team (partnered with Mexico High School’s T.O.R.Q. team coached by Galen Fellows) won tournament champions against [Co.R.E. ]’s very own “E” and “Y” teams. The “R” team also brought home the Skills champion award for having earned the highest combined driver and programming score for the skills challenge. All three Sandy Creek teams received praise from the event volunteer staff for their professionalism and sportsmanship both on and off the competition field. Congratulations to all of the students that competed on Saturday. The [Co.R.E.] teams are coached by John DeGone. In this year’s VEX Robotics turning point competition points are awarded through various skills and tasks. The competition takes place on a 12’ x 12’ field with eight caps, six posts, nine flags, 20 balls and two alliance and one center platforms. Teams maneuver their robots to score by placing the caps on the posts, toggling the lower flags and using the balls to toggle the higher flags with a back and forth battle to win the final score. The alliance parking can be used by robots from the same color alliance while the center platform can be used by either alliance, to earn additional points. The back and forth aspect further adds to the final moments of excitement in each match. Other matches are scheduled leading up to the NYS Competition to earn a spot in the World Championships scheduled in April. 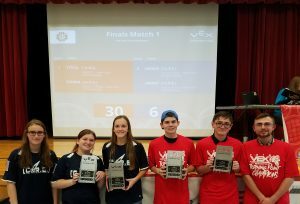 For more information about VEX Robotics and competitions, visit their website at www.vexrobotics.com.